The Independent Power Producer Procurement Programme (IPPPP) was put in place to manage the involvement and development of the Independent Power Producers (IPPs). Most of the IPP projects will be connecting to the Eskom electrical network. To this end the IPP sites need to be mapped. This article describes how they are mapped at plant level in both a geographical information system (GIS) as well as in an automated mapping/facilities management/GIS (AM/FM/GIS). According to the Department of Energy, the National Development Plan (NDP) identifies the need to invest in a strong network of economic infrastructure to support both the country’s medium and long-term economic and social objectives. Energy infrastructure is seen as a critical component that underpins both economic activity and growth across the country . Fig. 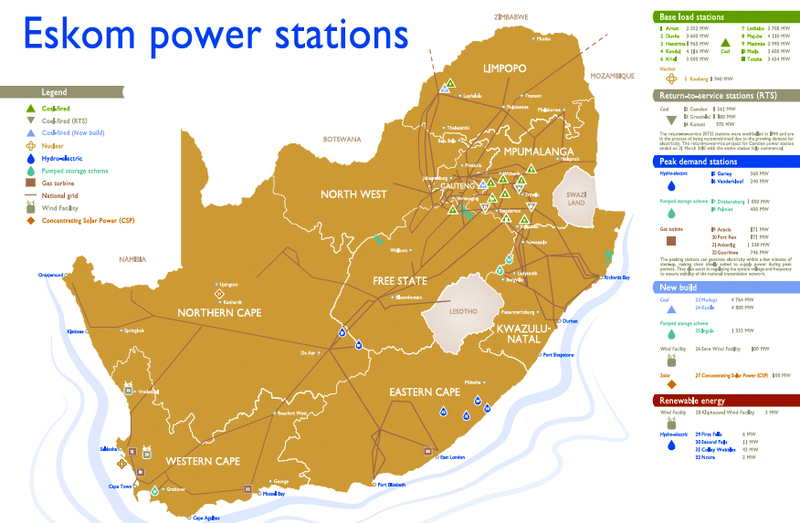 1: Map of Eskom’s power stations (Source: www.eskom.co.za). The NDP requires the development of 10 000 MW additional electricity capacity to be established by 2019 against the 2010 baseline of 44 000 MW . The Integrated Resource Plan (IRP) of 2010 has developed the preferred energy mix to meet the electricity needs over the next 20 years until 2030. A total of 17 800 MW of the 2030 target are expected to come from renewable energy sources, in line with the national government commitment to transition to a low carbon economy . 13 225 MW renewable energy consisting 4725 MW photovoltaic (PV), 1200 MW concentrated solar power (CSP), 6360 MW Wind, 195 MW small hydro, 25 MW landfill gas, and 210 MW from the Small Renewable Energy Programme. 7426 MW non-renewable energy consisting 2500 MW coal-fired plants (excluding cross-border), 1800 MW cogeneration, and 3126 MW gas-fired plants. A significant share of this new electricity capacity is to be developed and produced by IPPs. The introduction of private sector generation offers many benefits. It contributes to the diversification of the supply and nature of energy production, and assists in the introduction of new skills into the industry. It also brings new investment into the industry, and enables the benchmarking of performance and pricing. Fig. 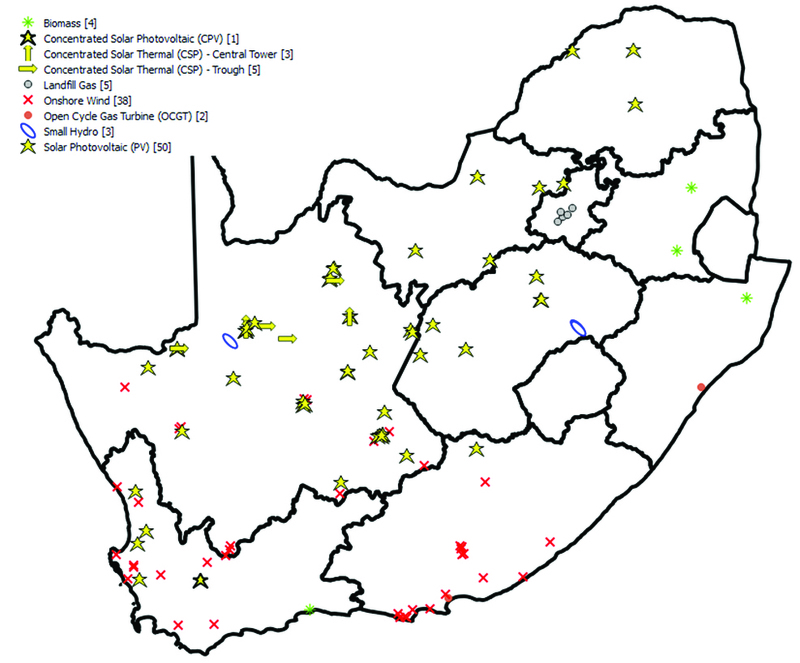 2: Map of IPP sites and Eskom’s renewable power stations. Compliance to the IRP 2010. The acceptance of a standardised power purchase agreement (PPA). Preference for the IPP plants to be placed so that they contribute to grid stabilisation and mitigate transmission losses, i.e. placed away from the present major generation plants. Preference for plant technology and placement that contributes to local economic growth. Fig. 1 is a map of all Eskom’s power stations. Note that most of the major coal-fired power stations are found in Mpumalanga province. In contrast, Fig. 2 shows the IPP sites and any Eskom renewable energy generation sites, and note that they are largely situated in the Northern Cape, followed by the Eastern Cape and Western Cape. Tables 1 to 3 summarises the IPP programmes as well as Eskom’s renewable energy power stations. Table 1 shows the split between the various programmes, while Table 2 shows the breakdown of the different technology types. Table 3 indicates the projects allocated to each province. Nearly half the projects are found in the Northern Cape, with the Eastern and Western Cape each having the next most. Fig. 3: Various IPP plant locations showing both the position and the plant extent. The first step in the process of modelling the IPP plant was to identify the position of the various IPP sites. This was more difficult to achieve thanitt may appear. Accurate positional information was hard to come by. The internet was used to gather this information. Sources of information used were presentations found on the National Energy Regulator of South Africa (NERSA) as well as various Environmental Impact Assessments (EIAs). The positional accuracy information in these documents was often vague, incorrect or missing. Satellite imagery was further used to confirm and refine these sites, particularly those already constructed or under construction – SPOT6 2015 data was very useful here. A further useful source of information was www.energy.org.za. Fig. 4: Geographical representation in the Eskom AM/FM/GIS, showing both the site location information and the basic electrical network information. This GIS data was created and managed using QGIS, an open source GIS. Point – position of IPP (for PV and concentrator PV (CPV) plants these were placed in the centre of the site; for other technologies it was placed on the IPP side of the substation). Polygon – boundary of area covered by the plant (sometimes this was estimated where there was not yet an indication of the IPP plant extent). Various attributes were also collected and stored in the “point/position” file. These fields were joined to the “polygon/site” file and only very limited attributes added to the “site” file, e.g. classification of how the boundary was drawn. In this way, all the attributes could be seen when viewing either of the tables as well as being kept synchronised (the old data rule of “enter once and use/view many times/places”). Fig. 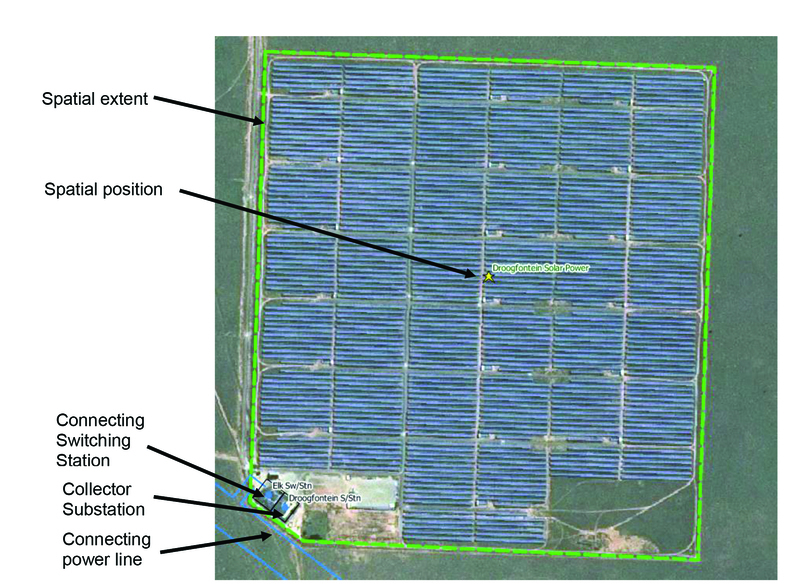 5: Geographical representation of a PV IPP in the Eskom AM/FM/GIS showing the true geographically captured objects. In contrast to the location mapping, the more detailed spatial modelling was done in Eskom’s corporate automated mapping/facilities management/geographical information system (AM/FM/GIS), namely GE Smallworld. A simplified version of the data was captured to meet the principle of modelling from the generator to the network or grid connection. In the case of PV and CPV, the intention is to model the DC/AC invertors as the generator. In the case of the other technologies there is a physical generator and this was used. The electrical network data is loaded spatially in the Eskom AM/FM/GIS as a topologically connected network. This data is then published to various other systems, or applications, for consumption. Some of these applications consume the data along with their topological connection values (usually graphical-based systems), while others consume it according to their hierarchal relationships (usually the text-based systems). Fig. 6: Schematic representations of the connection switching station and collector substation in the AM/FM/GIS. Graphical-based, such as the creation of network operating diagrams, power system simulation tools, fault and outage management system’s tracing function, and supervisory control and data acquisition (SCADA). Hierarchal-based, including asset management systems, dispatching and maintenance management systems, fault and outage management systems, network reliability performance indicator systems, or customer management systems. This spatial data is important to the business. For systems to have proper visibility of IPP related objects, it is essential that they are captured in the AM/FM/GIS. Connecting power line route co-ordinates and details. Connecting switching station corner co-ordinates and equipment layout and details. 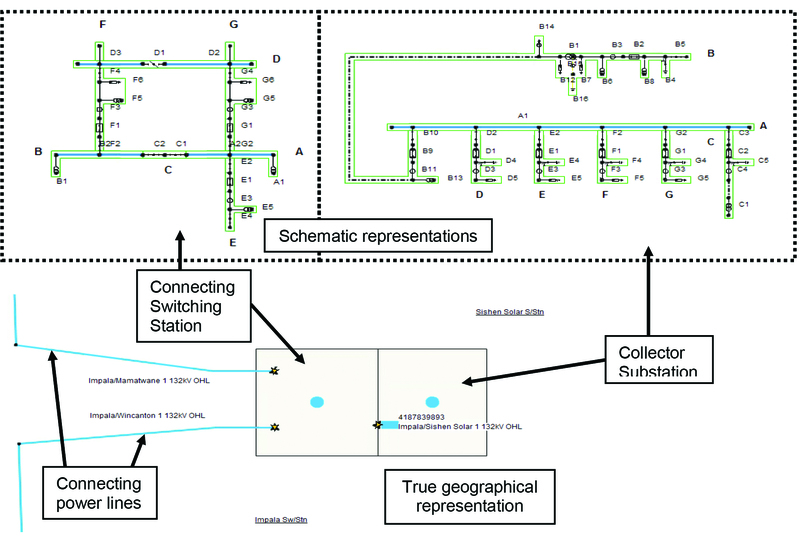 Collecting substation corner co-ordinates and equipment layout and details. Collecting network route information and details as well as generator positions and details. Fig. 7: Example of a result from a query in the AM/FM/GIS, showing a list of Macro-IPP generators. The spatial data was received in various formats, with permissible formats including ASCII file listings, Bentley MicroStation CAD files (.dgn), AutoCAD files (.dxf/.dwg), Esri .shp files, Google files (.kml/.kmz), or PDF files with geographical reference (i.e. grids). The data that was collected and kept in the IPP plant location dataset (i.e. QGIS data) were made available as an external, or local, dataset in the Eskom AM/FM/GIS (see Fig. 4). Table 2: IPP technologies used. Table 3: IPP project distribution across provinces. The IPP related data can now be queried in the Eskom AM/FM/GIS. Both text-based and spatial-based queries can be run to bring back related results which can then be used in by other functions and/or further analysis. The example in Fig. 7 shows the list of generators for a particular wind farm, as well as the sum of the “Active Power” field, i.e. the total generation capacity of the selected list. 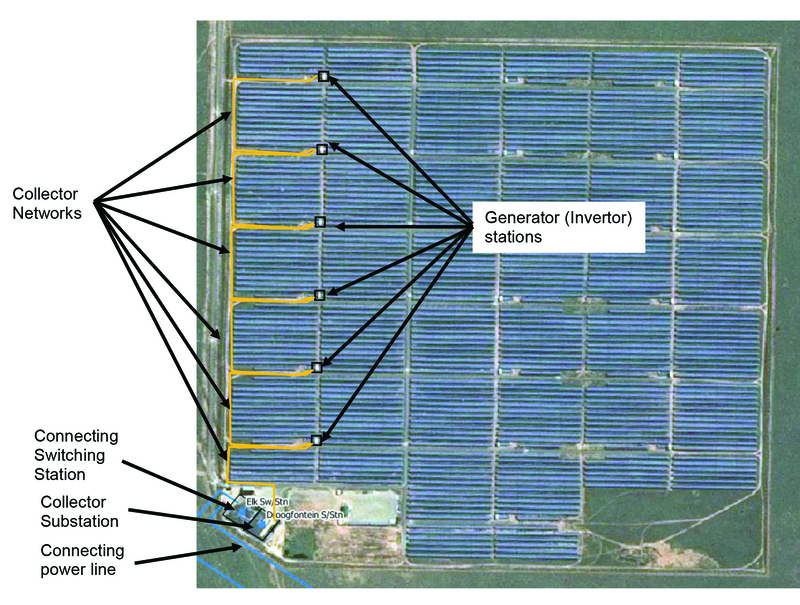 As demonstrated, it is possible to spatially model the IPP plant from generator to grid connection. This is all possible with the co-operation of the IPP plant owner’s assistance. Spatial modelling adds value to many other applications and so improves the information of and the interaction with IPPs. This article was presented at Geomatics Indaba 2016 and is republished here with permission. Department of Energy: “Independent power producer procurement program (IPPPP) – An Overview – as at 31 March 2016”, pp. 3-4, March 2016.